Enquire or book a trip along Cái Bè - Cao Lãnh - Long Xuyên - Châu Đốc. Boarding at Cai Be with a local boat through the Cai Be floating market. Boarding on the Bassac, welcome drink, introduction to the ship and crew. Check into the cabins. Boarding back about noon. Refreshed drink. 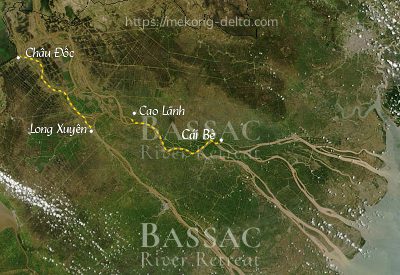 Lunch is served as the Bassac sets sail upstream the river towards Cu Lao Gieng island by entering into a small tributary of the river of the Tiger. By mid-afternoon, the Bassac drops the anchor for the visit of a XIXth century Franciscan monastery on shore. Breakfast is available from 6:30 AM, The Bassac cruises towards the floating market of Long Xuyen. Transfer on an local boat for a visit of a crocodile farm. Departure towards Tiger Island on the middle of the Bassac river. Lunch is served on board while en route. Upon arrival at Tiger Island, transfer onto the longboat for a visit of stilted houses, a typical local architecture. Breakfast is served from 6:30 AM, as the Bassac is on its way upstream the river towards Chau Doc. Upon arrival to Chau Doc, check-out and transfer onto a local boat for the visit of a village of the Muslim Cham minority and a floating fish farm on the way, then final disembarkment.